Someone asked me a question over on deviantArt about obijime and when to use what kinds and I realized I didn't actually know much about obijime specifics! So I'm in the middle of putting together what I can find and translate about the different types of obijime and such. In doing so I've translated two TPO charts and thought I'd add them to the IG pile. :) Here's the first! Please feel free to spot check me, especially on the fabric terms down in the Town Wear and Travel Wear section. I found it interesting that it specifically said a white obijime was ok to wear with mofuku. If this chart is ok, then I'll go on and post the other chart plus a specific chart talking about what I've been able to find regarding types of obijime. 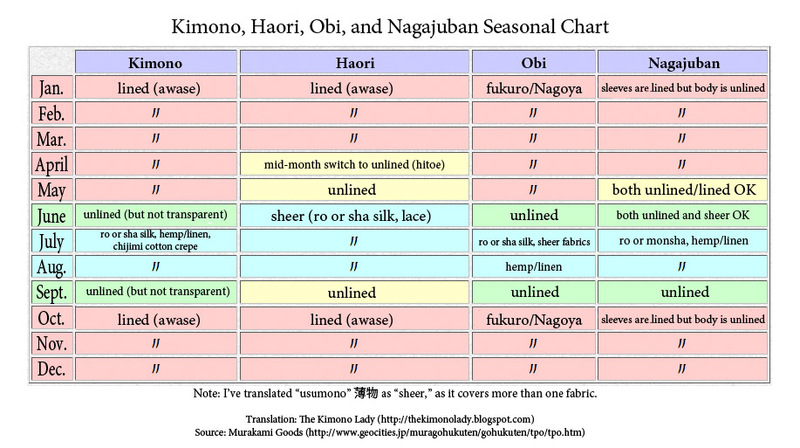 I've also done the kimono-accessories chart on that page as well, but haven't had time to format it yet. -is a maru obi appropriate for an iro-muji, even if it's crested? hikari_evyon: Thank you very much, but I'm sorry for being unclear: I meant if anyone can spot check my translation of the Japanese. I didn't make up this chart or decide what would go in each section, I'm just trying to provide a firsthand Japanese source and translating only what is there. For example, the source says maruguke for the mofuku. It also says a white obi-age is ok, which I had never heard before. I sat down and translated the TPO chart in Kitsuke to Obi Musubi (1978, ISBN4-06-141665-0 C577). I notice this chart doesn't give all suitable options, but it is good for a general idea. 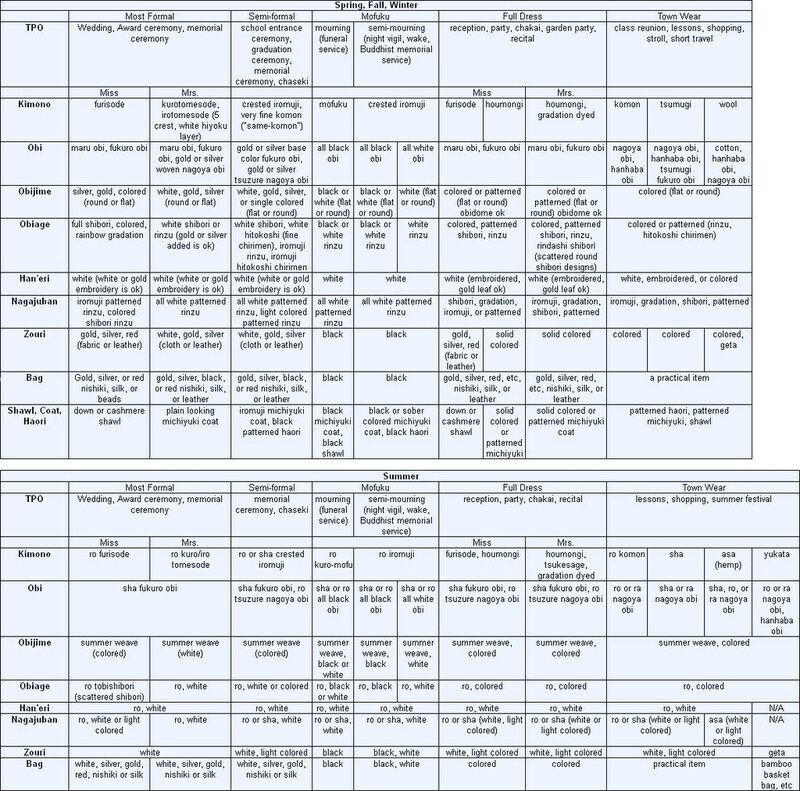 It is a very large chart, you will likely need to enlarge it further in flickr in order to read it well. Soooo is there such a thing as mofuku with only one crest, or is it always with 5? And re; mens wear, if it's black with 5 crests, is it formal wear AND mofuku? Or is there black formal wear that's specific for formal TPO and black formal wear that's specific to mourning wear??? What does a kaku obi for mourning wear look like?? Is it woven???? Mofuku for close family members should always have 5 crests. Most of the time they are only worn for the actual funeral, although some families might also wear it for some of the memorial days that follow. Otherwise, more distant relatives and friends may instead wear an iromuji with black accessories. Men's formal kuromontsuki with 5 crests is simply reisou, very formal wear, and for close relatives, there are no specific things that differentiate it between use at a wedding, and a funeral. That being said though, it is much more common for men to wear a black, formal suit with a black tie at a funeral, and not a kimono. I hoped that was the case re; men's formal/mofuku, thank you! I guess I assume the lining in formal men's wear will generically be white silk, or some un-decorated color in any case? I thought women's mofuku is always lined in white (with a black hakakke) but I'm pretty sure I've seen 5 crested men's kimono lined in navy.